Having spent the whole weekend behind closed doors..entertaining children and cooking I got up Monday morning feeling under the weather. I couldn’t be sure if it was just over-tiredness having had a rather full week but I’m usually as fit as a flea and my visits to the gym keep me fairly energetic. So I was irritated to find that I felt as if I had something lurking. I had already had a Virus and got a chest infection and been on a course of antibiotics and I was thinking here we go again!!!. I hate being I’ll and refuse to give into to it. So taking large amounts of “First Defence” I swear by that stuff and two strong pain killers I trip into work. As usual being a Monday I had an in box full of CVS , 150 to be precise with more trickling in all morning. I know from experience that this lot will only yield a few workable possibilities but never the less they all have to be examined. So head down and I spend the morning going wordblind. At lunch time I logged onto my hotmail account to check my messages. My phone is not always reliable and seems to please itself where emails are concerned. I had recently been chatting to a slightly older guy from POF! dating website. He seemed interesting and I like to keep my options open and technically he is still TB material as he younger than me by a few years. I knew his first name and I was expecting him to send me some more photos through so when his name appeared in my in box I thought he has sent them from another account so stupidly I opened the mail. But it turned out to be just spam so I deleted it. An hour later my phone was going mad with delivery reports saying I had undelivered messages. But I hadn’t sent any bloody messages what was going on ? I was horrified to find that a variety of messages had been sent to all my contacts I had let loose a Virus!!! Great. Everyone that I didn’t want to contact ..(.where I was playing hard to get ) All those that I had spoken to and given up on including the “Stalker” BLOODY EVERYONE. I quickly sent another message stressing that it was a virus and not to open it, but I knew that some would use it as an excuse to speak to me and three or four trumped-up to engage me in conversation as expected. Not of course those that I would have loved to have heard from far too much to hope for. So having reset my password and deleted XY and Z I hoped that was an end to it. But this afternoon I heard again from the Stalker. He came up in his orignal guise asking if I had received the picture he had sent me . I said no to play him along . Last time we had chatted under his original ficticious character I had played a good hand and he had proffered me his mobile number asking me to call him. I wrote it down just to be sure and then when at work I checked it against the one on Cs CV. Praise the Lord!! it was one in the same . So I now had irrefutable proof that it was he!!! Elementary my dear Watson!! He realised I think, that giving it too me was a mistake and he went promptly off-line. This was the first time he had mailed me since. The picture came through and it was the one he had used on TBW . 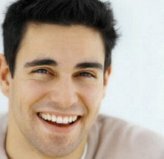 An incredible handsome guy with a perfect smile (We had located it on a Tooth Whitening website see pic) Did he think I was born yesterday (Lol! I wish) I could resist no longer and said “If I remember rightly you aren’t all you appear to be ” I got the a line of ????? as a reply . I typed “Come on C the game is up and has been for a while” I could hear the shocked silence all the way from Reading or Swindon or wherever it was he said he came from” Rubbing salt in the wound and rather enjoying it I have to say “I said he might as well give up and how pointless it all was and finishing with the truth about the photo. He dissappeared in a puff of embarrassed smoke . I have now blocked all his user names (I hope) But will be keeping an eagle eye out for him just in case. On the TB front I was hoping to get busy this week as the flat was available for a couple of nights. So when my daughter phoned me to say her plans had been changed I was not best pleased. I am at everyone elses mercy including her work schedule. But as I was feeling a bit naff maybe it was for the best, but my opportunities are so limited these days. Texts flew back and forth and the one night that I did have the flat for was the one that no one could do!!!. Ah well me some pasta and a hot toddy then!! not quite what I had in mind. Just have to lust after the men in The Vampire Diaries !. Never have I seen a programme with such a hot male cast and if Daemon hasn’t got his shirt off in the first five minutes then I shall be disappointed. Maybe I should just let them know that my neck is available Ha!.Shame its the last one tonight. I shall miss salivating over the Salvatores! On a more hopeful note I may have a lunch date with Mr Slightly Older on the horizon and will be seeing my girlies tomorrow evening so all is not lost. It’s the lull before the storm this week after that the Christmas celebrations begin in earnest. I just hope I’m going to be fit enough to take full advantage…I wonder when the next full moon is……. WHAT DO YOU HAVE FOR LUNCH ?? Putting on the RitzSex on the Brain!